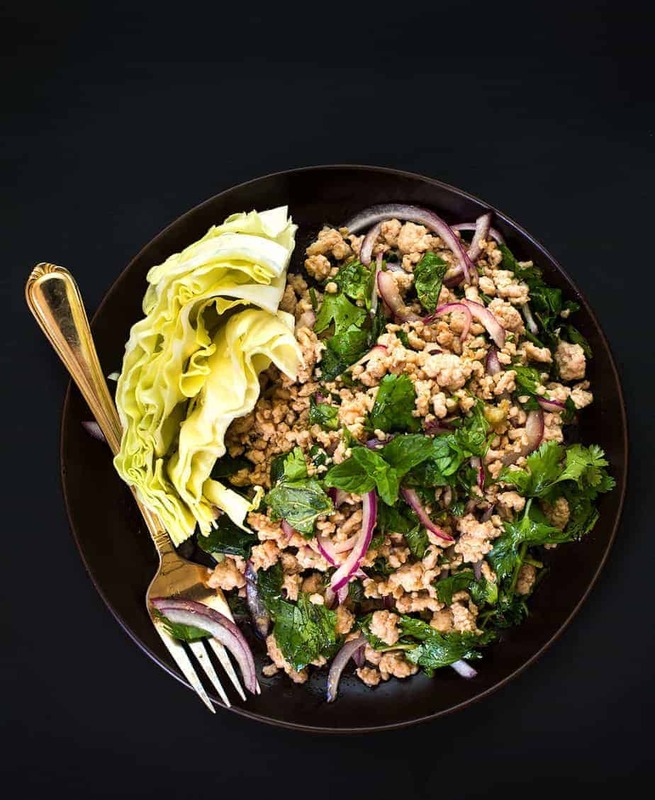 This easy larb recipe with chicken is so easy to make, fresh ingredients perfect as a side dish or main dish. The taste is very refreshing, combination of fresh ingredients: mint leaves, cilantro, lemongrass, lime juice. 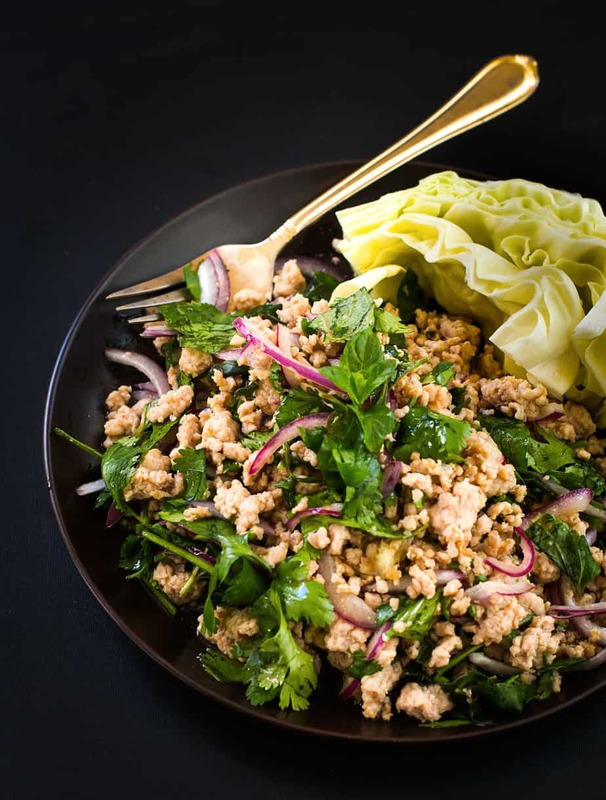 Wrapping a meal in lettuce or cabbage leaves dates back hundreds of years in Asia, but really didn’t become too popular in the US until more recently (likely when lettuce wraps from a larger chain became quite popular). I’m a big proponent of using lettuce or cabbage to wrap up food. 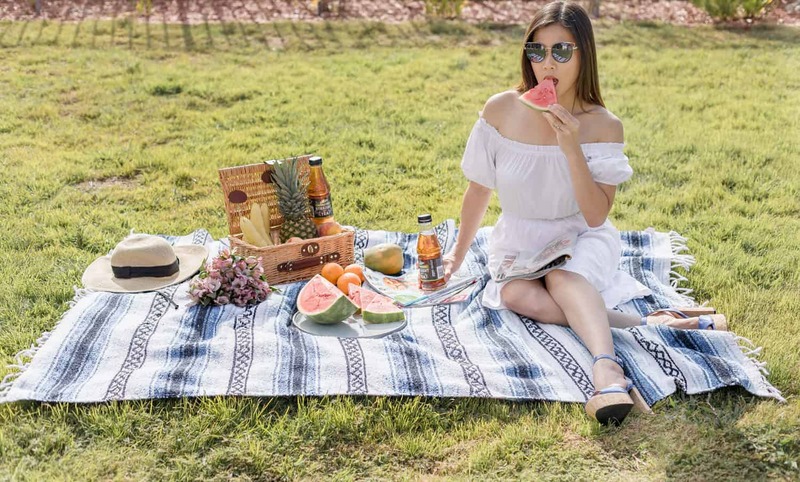 First of all it’s a lot more fun than using a fork or spoon and a great way to consume healthy, leafy vegetables. Each bite has a nice contrast too of being milder at first then getting to the juicy vegetables, meat and spices inside a split-second later. 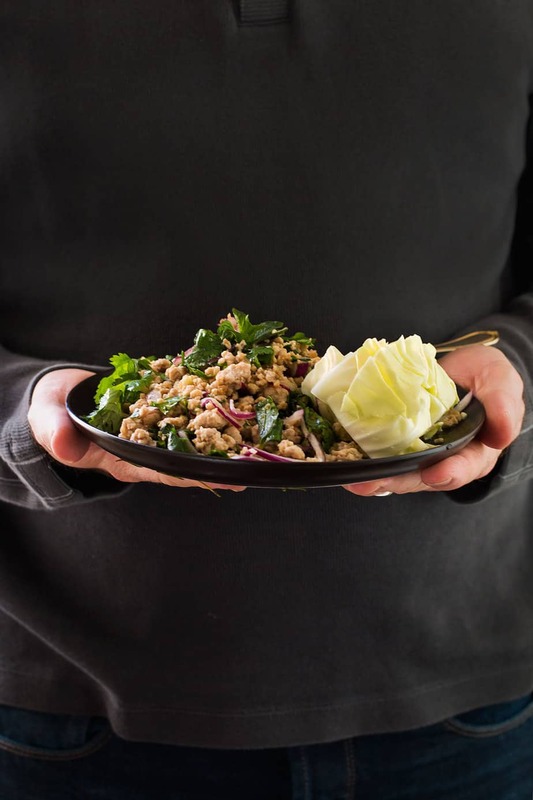 I have tried different larb or similar recipes from a number of countries in Asia: Cambodia, Thailand, Laos and Vietnam. The below recipe has a couple of items sourced from Thailand, but takes inspiration from all of these countries. Place a skillet over high heat and and add low sodium chicken broth. Bring to boil and add ground chicken. Stir continuously to prevent lumps. Cook until chicken is browned or cooked through about 6 minutes. Mix fish sauce, fresh lime juice, sugar, red onions and lemongrass in a mixing bowl, then add cooked ground chicken. Stir until well-mixed. Stir in fresh mint leaves and cilantro right before serving and spoon the mixture into the cabbage to serve. That sounds like a great recipe!I think my whole family would enjoy this meal, so I will definitely be tryng it. I’m always on the lookout for chicken recipes. I’ve never had this one before. I can’t wait to try this. That looks so yummy! I’ve never made anything like this before, but I love the texture and look. I can’t wait to give this one a try. I am trying to eat more lettuce and less bread I am still a work in progress though I bought the wrong lettuce (too big), but I have actually enjoyed it and not missing the bread really all that much. This looks awesome! that sounds so delicious! I love salads and can’t wait to try this out! thanks! I’m loving all of the veggies in this recipe. I’d love to try making this. The hint of spice sounds really good. What a great and easy recipe! I love stuff like this that is quick and healthy for dinner. Great recipe! My in-law make this all the time! So yummy! Definitely have to eat it with lettuce! That looks so good and a healthy meal too. Thanks for sharing the recipe! There’s a magic from lime juice that makes any kitchen dish so delicious! This sopunds and looks tasty. This sounds so delicious. And with lemongrass in it, I bet it smells divine too. Now I’m so hungry! That looks fantastic! I would love to try this with my family. Thanks for the recipe. This looks so delicious and easy to make. I will have to get the ingredients i need to make it this week. This is a new way to prepare chicken for me! It looks like I could follow the instructions to recreate this, and it looks SO yummy! Oooo this is definitely a unique dish!!! Looks so yummy though. Definitely need to give this a try! Your pictures are beautiful! I will have to try this recipe! 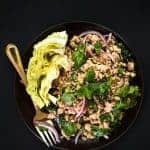 Usually low carb recipes are boring but it looks like you have nailed this one!! Great job!! I just made this tonight. I have to say the amount of fish sauce it calls for is too much. If you do 2T instead of 1/3 cup and increase the broth to 1/3 cup it will be delicious. I’m sorry, but the fish sauce ruined it for me. I will try again!